Well I've done it I've landed a cat, this 19.4lb beauty was caught using a Baitwize RF1. I've been introducing these baits in since last Sunday and on its first official outing on Thursday it gave me a run the I just could not stop or control eventually my line gave in on my hook link. 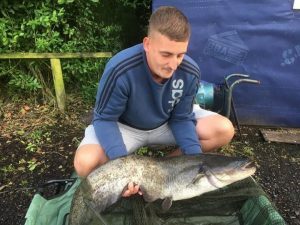 When I reeled it in I could see the line was a little frayed making me think I had hooked and lost one of the big cats in berts pool at hillside fishery. Today I won this round on almost the same set up the only thing I changed was my hook length opting for a multi rig using Korda size 4 kurve shanks and green braid bought off eBay. My bait was presented with a mini fake sweetcorn topper which has worked again this bait is in my mind brilliant as both times no free offerings were needed just what I put on the rig and nothing else this baits is A1.